Calculation related to question of why the universe is made of matter. Kids everywhere grumble about homework. But their complaints will hold no water with a group of theoretical physicists who’ve spent almost 50 years solving one homework problem—a calculation of one type of subatomic particle decay aimed at helping to answer the question of why the early universe ended up with an excess of matter. Without that excess, the matter and antimatter created in equal amounts in the Big Bang would have completely annihilated one another. Our universe would contain nothing but light—no homework, no schools…but also no people, or planets, or stars! According to the Big Bang model, the Universe expanded from an extremely dense and hot state and continues to expand today. A common analogy explains that space itself is expanding, carrying galaxies with it, like spots on an inflating balloon. The graphic scheme above is an artist’s concept illustrating the expansion of a portion of a flat universe. Physicists long ago figured out something must have happened to explain the imbalance—and our very existence. 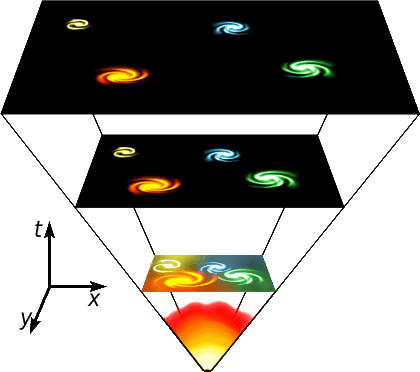 “The fact that we have a universe made of matter strongly suggests that there is some violation of symmetry,” said Taku Izubuchi, a theoretical physicist at the U.S. Department of Energy’s (DOE) Brookhaven National Laboratory. The physicists call it charge conjugation-parity (CP) violation. Instead of everything in the universe behaving perfectly symmetrically, certain subatomic interactions happen differently if viewed in a mirror (violating parity) or when particles and their oppositely charged antiparticles swap each other (violating charge conjugation symmetry). Scientists at Brookhaven—James Cronin and Val Fitch—were the first to find evidence of such a symmetry “switch-up” in experiments conducted in 1964 at the Alternating Gradient Synchrotron, with additional evidence coming from experiments at CERN, the European Laboratory for Nuclear Research. Cronin and Fitch received the 1980 Nobel Prize in physics for this work. 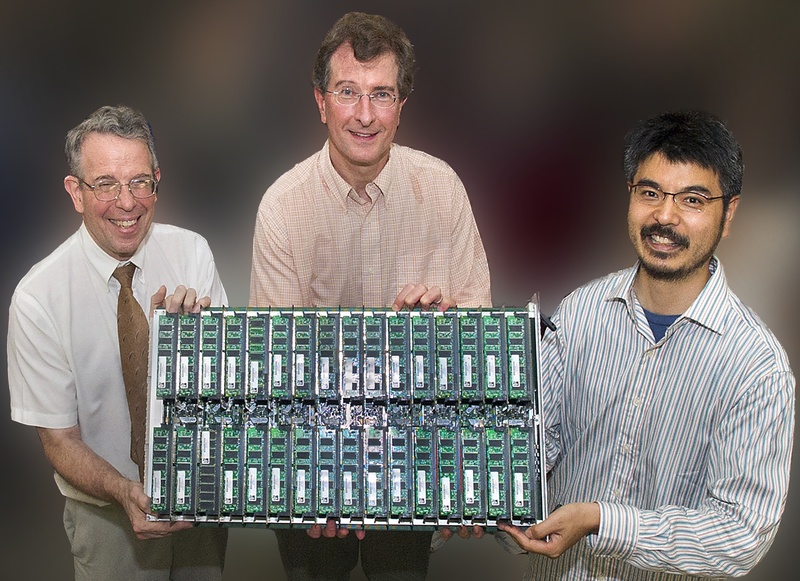 Theoretical physicists and kaon-decay calculators Norman Christ, Robert Mawhinney (both of Columbia University), and Taku Izubuchi (of Brookhaven), holding one rack of the QCDOC supercomputer at Brookhaven, which was used for many of the earlier kaon calculations. It was replaced by QCDCQ in 2012. 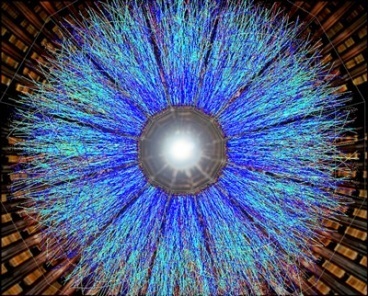 What was observed was the decay of a subatomic particle known as a kaon into two other particles called pions. Kaons and pions (and many other particles as well) are composed of quarks. Understanding kaon decay in terms of its quark composition has posed a difficult problem for theoretical physicists. “That was the homework assignment handed to theoretical physicists, to develop a theory to explain this kaon decay process—a mathematical description we could use to calculate how frequently it happens and whether or how much it could account for the matter-antimatter imbalance in the universe. 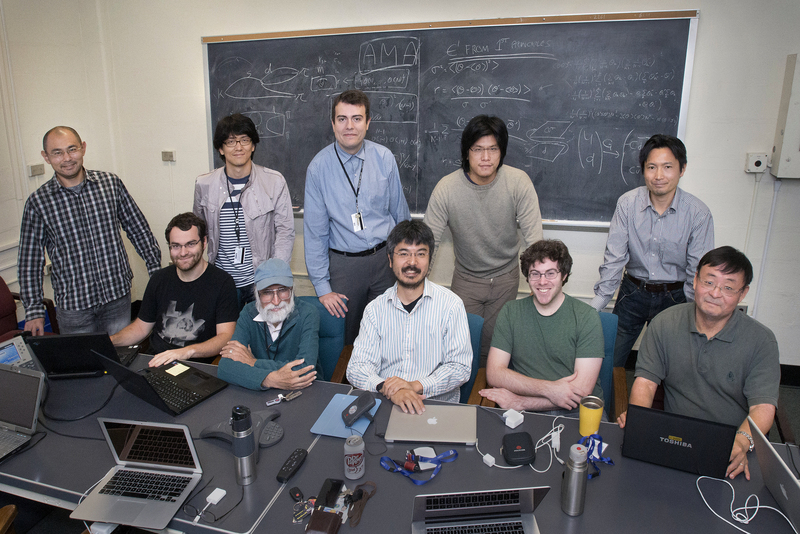 Our results will serve as a tough test for our current understanding of particle physics,” Izubuchi said. The mathematical equations of Quantum Chromodynamics, or QCD—the theory that describes how quarks and gluons interact—have a multitude of variables and possible values for those variables. So the scientists needed to wait for supercomputing capabilities to evolve before they could actually solve them. The physicists invented the complex algorithms and wrote nifty software packages that some of the world’s most powerful supercomputers used to describe the quarks’ behavior and solve the problem. The supercomputing resources used for this research included: QCDCQ, a pre-commercial version of the IBM Blue Gene supercomputers, located at the RIKEN/BNL Research Center—a center funded by the Japanese RIKEN laboratory in a cooperative agreement with Brookhaven Lab; a Blue Gene/Q supercomputer of the New York State Center for Computational Science, hosted by Brookhaven; half a rack of an additional Blue Gene/Q funded by DOE through the US based lattice QCD consortium, USQCD; a Blue Gene/Q machine at the Edinburgh Parallel Computing Centre; the large installation of BlueGene/P (Intrepid) and Blue Gene/Q (Mira) machines at Argonne National Laboratory funded by the DOE Office of Science; and PC cluster machines at Fermi National Accelerator Laboratory and at RIKEN.